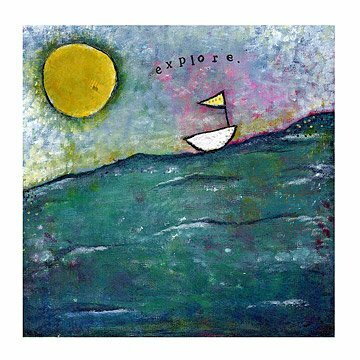 Elizabeth McDonnell's image of a small boat braving the ocean makes a great addition to a child's room, or can inspire friends and family of any age to never stop exploring uncharted territory. The sun was collaged from a vintage music score, with a single note peeking through to add some playful energy. Designed and printed in Philadelphia. Elizabeth McDonnell is thrilled to have found the connection between her two favorite things: creating art and inspiring people to dream. She creates art and gifts to bring inspiration, love, and lots of color to lives everywhere. Based in Philadelphia, Elizabeth finds inspiration in nature, music, children’s books, quotations, affirmations, and color. She has a professional background in poetry and arts administration, and worked in non-profits for over ten years before rediscovering her love for painting. Her main focus is to create vibrant, joyful art that makes you and your loved ones feel good. If the print is not framed, keep dry and flat with enough space to avoid damage to the corners. The matted print comes with a standard-sized mat for easy framing. This was a gift for our daughter-in-law who loves to travel. She seemed to really like it. I love it. This print can inspire friends and family of any age to never stop exploring uncharted territory.